Hosting Raja Review 2019: Is Hosting Raja a Good Hosting? Hosting Raja is an Indian full-service hosting provider. Its hosting plans run on SSDs and come packed with features for beginners and experts, but you need to sign up for five years to realize the most benefit. Hosting Raja has been providing hosting services in India since 2012 and has accumulated more than 1.5 million customers. 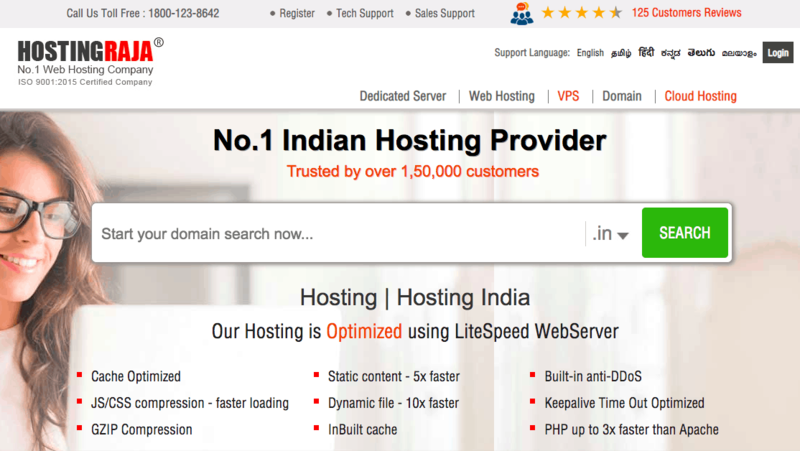 This company claims to provide the fastest servers in India, and its support is provided in English, Tamil, Hindi, Kannada, Telugu, and Malayalam. There is a wide variety of hosting plans including Windows hosting, unlimited hosting, Linux hosting, WordPress hosting, dedicated servers, and virtual private servers. One of the most notable plans is the Unlimited plan that (unsurprisingly) comes with unlimited bandwidth, domains, subdomains, email, MySQL databases, FTP, and add-on domains. Hosting Raja’s SSD-based servers are based in India, they use the popular cPanel control panel, and they benefit from an SLA-backed 99% uptime guarantee. New website owners can quickly and easily get started with Hosting Raja since the plans come with a drag-and-drop website building tool, a one-click installer (for an unspecified number of programs), and WordPress or other CMS setup. At the other end of the expertise spectrum, advanced users will appreciate the support for FTP, SFTP, PHP (latest version), and phpMyAdmin. And unlike some hosting providers, this one supports additional advanced coding languages like Ruby on Rails, Python, CGI, Perl, and cURL. You also get Cron jobs to schedule regular scripts. Hosting Raja’s prices are reasonable considering the high resource allocations, and they are certainly a lot cheaper than local and international competitors offering similar inclusions. Some of the plans come with free SSL certificates and a domain for life. If something looks too good to be true, it probably is, and the catch here is that you need to sign up for five years to get the best prices. Since there is no money-back guarantee and no free trial, this commitment may well be too much for you, in which case you will find that the one-year price is reasonable (but not exceptional). You can also sign up on two, three, or four-year terms. 24/7/365 customer service can be accessed by phone (to sales, technical, and renewal departments), email or live chat. The Hosting Raja website contains a small FAQ section, but this is not sufficient for you to support yourself. This company has positive reviews for its customer service, but my experience as a presales prospect was not so positive. 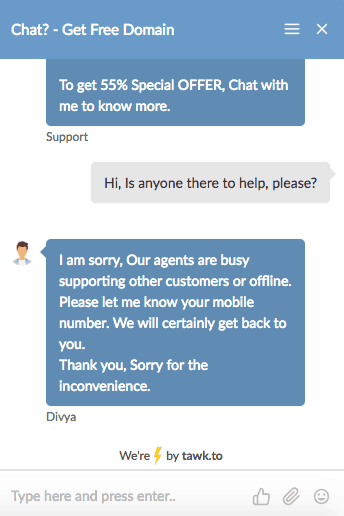 Nobody picked up my live chat when it looked to be online, although – to be fair – it was the middle of the night in India. More worrying for me was the fact that my email approach went unanswered for four business days… and counting. Hosting Raja is an impressive Indian hosting company that has been in business since 2012. With some big Indian names such as the Housing and Urban department as customers, and with more than two million likes on Facebook, this company certainly has a good reputation. My only slight concerns are the relatively low uptime guarantee and my less-than-positive experience as a prospective customer. However, the feature-packed plans do come at affordable prices. Wondering how Hosting Raja stacks up against other Web Hosting companies? Enter any other Web Hosting company and we will give you a side-by-side comparison.